The Council is helping a Cheshire business to become more competitive within both the UK and Europe by supporting its efforts to raise its profile on social media. 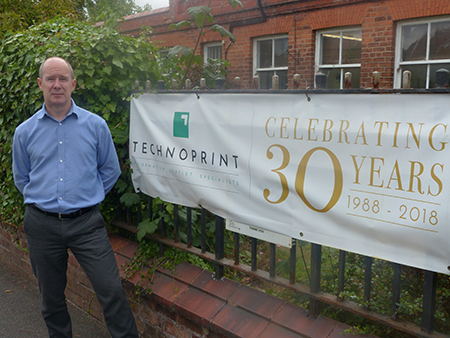 Staff from Technoprint in Winsford have been attending the Council’s social media workshops and is starting to see the benefits of his staff becoming more confident in promoting the company online. Technoprint has been producing the patient information leaflets which people use to help them take their medication correctly for 30 years and has built a good reputation among its huge global customers in the pharmaceutical industry. Its managing director Alan Ryan said: “We are rapidly growing; we are twice the size we were four years ago. We have got a lot of success but we have got a lot potential success with some very large organisations. We are not going to win work just by making a phone call. We need to build up a brand and a reputation and we feel social media is the platform we can do that on. “If the potential customers see us an expert in our field and see the success we are having then that gives them the reassurance to contact us. We are using social media to get that message to potential customers much quicker. Social media is the new way of selling. “We sent two members of staff to the Council’s social media course. They have now got a better understanding of how to use social media and also some of the software that you might use to put one story on several platforms. That just gives them the confidence and knowhow of how to run social media rather than outsource it to someone who was managing that for us. “Since we attended the courses three to four months ago we have found that our social media systems are working better. We want to start bringing social media in-house rather than outsourcing the work and the early signs are that we are going to do a much better job than before, the messaging is going to become clearer, giving a better message to our potential customers. The workshops are run by the Council’s business growth team as part of the Support and Workspace for Businesses in Key Growth Sectors Project; the project runs until August 2019 and is part funded by the European Regional Development Fund (ERDF). The Council is inviting other businesses to attend the forthcoming workshops. A ‘Let’s Talk Social Media’ workshop is being held at Mercure Chester Abbots Well Hotel in Chester on Wednesday, 12 September from 8-10am and businesses are welcome to book their place. Cllr Brian Clarke, Cabinet Member for Economic Development and Infrastructure, said: “The workshop will help businesses to use social media platforms to promote a business product or services and explain how staff can develop and engage an online audience. It also looks at the tools available to help businesses manage the time it takes to create a social media presence. “Any Cheshire West small and medium sized businesses with less than 250 employees which is looking to expand is welcome to attend a workshops. Business can attend more than one workshop. They are aimed at demystifying subjects and upskilling staff in areas such as GDPR, finance, branding, website and social media. Some of Alan’s staff have also taken the opportunity to attend other Council workshops and he says his business has benefitted as a result. A content workshop will be held on 18 September at Memorial Court in Northwich from 9.30am-12.30pm. It will help businesses create engaging online content which engages customers. Next month, a ‘Let’s Talk Websites’ workshop will be held at Memorial Court in Northwich on 10 October from 8-10am, and a ‘Let’s Talk Finance’ workshop will be held at Chester Abbots Well Hotel on Wednesday, 17 October from 8-10am.